This is a play that I had never even heard of until it was set as part of my course on the Gothic; apparently there's also a film version of it that I had never heard of either. But, after reading the premise, I was intrigued about where it would head. So, after a very quick read-through, what did I think? 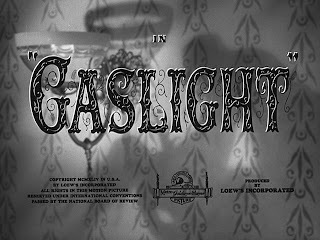 Gaslight starts in a dark and dingy Victorian house, where we meet married couple Jack and Bella Manningham. Tension is running high between them, due to a series of objects going missing around the house, only to turn up hidden in strange places; Bella is assigned the blame for this, but because she doesn't remember doing anything of the sort she believes that she has inherited her mother's madness. It is only when she is visited by a former police detective while her husband is out that Bella is given reason to suspect that he might not be the man she thought he was. For me, the plot would have been more suspenseful if the blurb hadn't summed up the entirety of the play. As a plot though, it's well executed, if a tad predictable at times. Rough, the police detective, tends to lay the hints on rather thick. Although I will give the play credit for the fantastic final monologue that Bella gets, which is most satisfying considering the stuff she goes through in this.